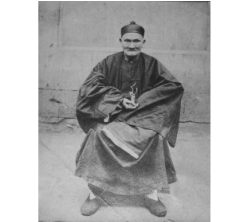 Li Ching-Yuen was quite the extraordinary man. As a Chinese herbalist, he lived 256 years or 197 by his own account. Either way this is far more than is recognized as the maximum human life span. The New York Times covered Li Ching-Yuen several times including after his death in 1933. In 1930 it was said Professor Wu Chung-chien, dean of the department of education in Minkuo University, had found records showing Li was born in 1677 and that the Imperial Chinese Government congratulated him on his 150th and 200th birthdays. Li Ching-Yuen lived active life working till his last days. This method is reserved for practitioners who are familiar with archaic form of pulse diagnosis described in Nanjing, classic of difficult issues. During this treatment we use a form of solar energy. This energy is not transmitted in form of light as many understand word solar; it is transmitted in form of radio waves created during the rotation of Earth. This form of energy rotates planets in our solar system and was known for ancient Chinese as Qi 氣 or breath. This energy produces electromagnetic changes of astronomical magnitude; it influences our blood circulation and is registered through the pulse. Someday people will find much wider use of this energy as it works day and night and is not a light only. We use this form of solar energy to induce patient into resonance with astronomical electromagnetic changes. It is the state when human body was an embryo. Ancient Chinese named it as 先 天 «previous heaven» or life before birth. This is the state of metabolism when everything is working in absolute balance. Practitioners of archaic period used this state to treat any disease. Many years of research helped me to decipher ancient medical texts written in special encoded language, register and record effect of extra long radio waves created by interaction of the Earth and Sun and to induce patients in condition of embryonic state during each treatment. Patient induced into embryonic state resonates with astronomical electromagnetic changes with each cell of all tissues, producing immediate healing reaction. Ancient Chinese didn't differentiate diseases, but they used this most powerful tool of truly universal medicine to treat any diseases. Practitioner treats patient using his or her own body as resonator or antenna to receive double more healing energy. Now we can even measure this energy. Contact between patient and practitioner happens through the needle or the finger. Embryonic state of previous heaven doesn't make patient unresponsive. Patient is conscious of all what is happening. Practitioner treats Qi 氣 of patient employing Qi 氣 of space restoring order in metabolism using resonance of universe. From treatment to treatment patient is able to stay in resonance longer and longer after each treatment, keeping this condition sometimes for weeks. It makes best grounds for recovery. This condition is controlled each visit by pulse. Earth rotates with different speed accelerating and decelerating. It makes impossible to stay permanently in 先 天 «previous heaven» embryonic condition, slowly producing unbalances and returning into «after haven» 後 天 or after birth state. It is the condition of slow increase of disorder which produces diseases and death and is normal for most of us. Ancient Chinese invented practice of Internal Alchemy, when each person can be induced into resonance with natural universal force again and again before disease starts. Now this practice is familiar to all practitioners who are familiar with archaic form of pulse diagnosis and treatment described by NanJing, classic of difficult issues. After 2000 years this practice is back. Celestial connection 天 經 is restored again through acupuncture.